I had just landed my first job in broadcast television as an account executive; one who sells commercial time to local businesses and advertising agencies. The time was pre-digital revolution, and broadcast television was the dominant form of mass communication media in our culture. My new employer was a start-up independent television station; we weren’t even on the air yet. Consequently, we were an inexperienced staff and needed to learn the basics of the business. Our sales manager set up a series of training sessions where we learned the lexicon of our craft: ratings, shares, huts, and puts. Pretty basic stuff and having been out of the biz for some time now, much of it forgotten. However, there was something my sales manager said in those early days that has always stayed with me. He said the reason that television held such a prominent place in our society was due to the nature of the moving image itself. For it is the only the moving image that combines the elements of sight, sound, motion, and emotion. The other forms of mass media may contain some of these elements, but only the moving image incorporates them all into one experience. That really struck me. Not only because it was so true, but also because it explained the power of the dominant form of world communication in such simple terms. We are emotional beings. That which touches us at the deepest level emotionally tends to have the greatest impact. It is through our television, film, and computer screens that we experience this rich mix of ingredients that combine to move us in such a deep emotional way. Today’s world of new media has only enhanced the power of the moving image. No matter how you measure media impact: money spent, time spent, or influence in shaping world events, moving image media are the world’s preeminent form of communications. Have you had a great film change your life? The excellent documentary film Hoop Dreams permanently shifted my perception of inner city life. The life-changing lessons presented in Its a Wonderful Life are anchored more deeply each time I view the film. No one would argue the impact of An Inconvenient Truth on the issue of climate change. Unfortunately, the media business I was in did not aspire to such lofty heights. Over time, I became concerned about my role in the marketing machine of commercial television and left a very good job. I was not sure of my next move, but assumed my professional relationship with the moving image was over. However, my first sales manager’s words stayed with me. The power of the moving image to move people, to change perception, to move the world forward, was just too compelling to let go of. 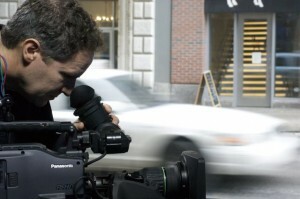 At the age of 44, I decided to go to film school.